Sri Lanka wins Bronze at Asian Weight Lifting Tournament! Pakistan’s national carrier, Pakistan airlines has paid US$ 2 million in arrears for the Airbus A330-300 aircraft it wet-leased from debt-ridden Sri Lankan Airlines last year, authoritative sources said. The crisis-ridden Pakistan International Airlines (PIA) suspended its lease with Sri Lankan on February 9 with US$ 2million still outstanding. It will no longer lease two additional A330-300 aircraft from SriLankan as earlier planned, authoritative sources confirmed. 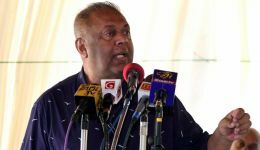 SriLankan Airlines management maintains, however, that the PIA wet-lease was one of the most advantageous deals the company has ever struck, earning almost US$9 million profit in six months. The figures could not be independently verified. “They flew more than the contracted number of hours per month,” said Suren Ratwatte, Chief Executive Officer of SriLankan. “So the extra flying was practically all profit for us.” He refused to divulge numbers, saying those could only be calculated once the leased aircraft is returned and the last invoice is settled. PIA announced in a statement this week that Pakistan ’s national aviation policy did not allow it to wet-lease an aircraft for more than six months.